Ah, October. Leaves changing color, nights getting cooler, days getting shorter. It’s a beautiful season, full of tradition. Sadly, a new tradition has recently entered my annual calendar–the tradition of “Being tortured by all of my American friends drinking Pumpkin Spice Lattes.” Or consuming pumpkin flavored anything, for that matter. I hear that even Ben & Jerry’s has a Pumpkin Cheesecake flavored ice cream out right now. Is it wonderful? You can tell me, I won’t cry. Now, don’t get me wrong, Japan is all about seasonal flavors, and pumpkin is right up there on the list for autumn. Chestnut, sweet potato, and of course, pumpkin are everywhere right now, from beverages to desserts to chocolates. Unfortunately, Japan seems to have missed the memo on the whole “Pumpkin Spice” thing, perhaps due to a lack of North American style Thanksgiving and it’s related pies. No cinnamon, no ginger, no nutmeg. No cloves, no cardamom. When they say pumpkin here, they mean pumpkin. That’s it. It’s really more of a squash flavor, actually. Stores and restaurants are full of it right now. You find a lovely pumpkin pudding, or a pretty pumpkin parfait, and that squash flavor just jumps up and punches you in the tongue with sadness. I’ve had my heart broken enough that it doesn’t even bring a tear to my eye any more. We even sometimes carry a shaker of pre-fab Pumpkin Pie Spice on the go for those pretty puddings that just need a little dash of something special to lift the squashy, squashy goodness up to something heavenly. Perhaps my tastes are adjusting to a more Japanese sensibility, because I actually quite enjoyed this. It’s delicate and subtle. 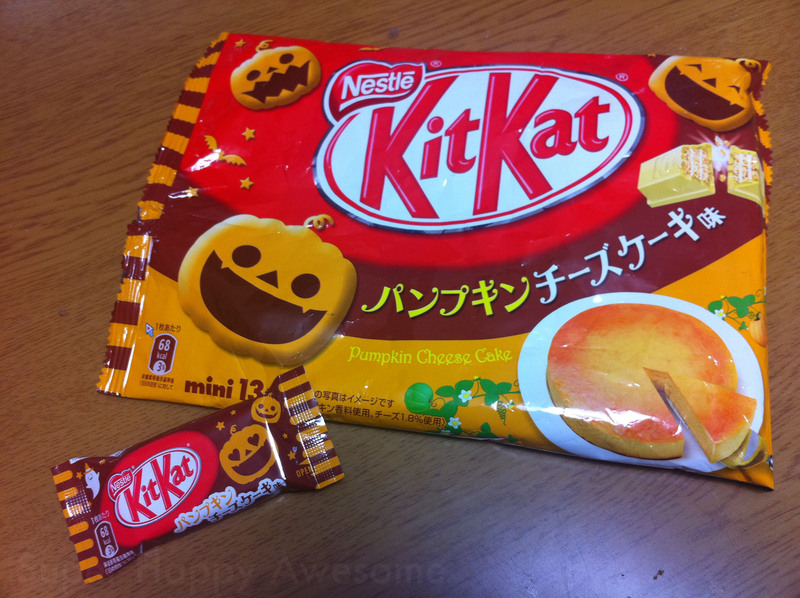 The pumpkin goes well with the white chocolate, and the cheesecake flavor is mild but noticeable. And after I sprinkled a little of our Pumpkin Pie Spice mix on them? They were incredible! And the packaging is pretty adorable too. Heart-eyed vampire Jack-o-Lanterns? Too cute! Anybody else try them? What did you think? Anyone back home want a bag, or is pumpkin without pie spices too ridiculous? And Happy Thanksgiving, to all you Canadians out there! 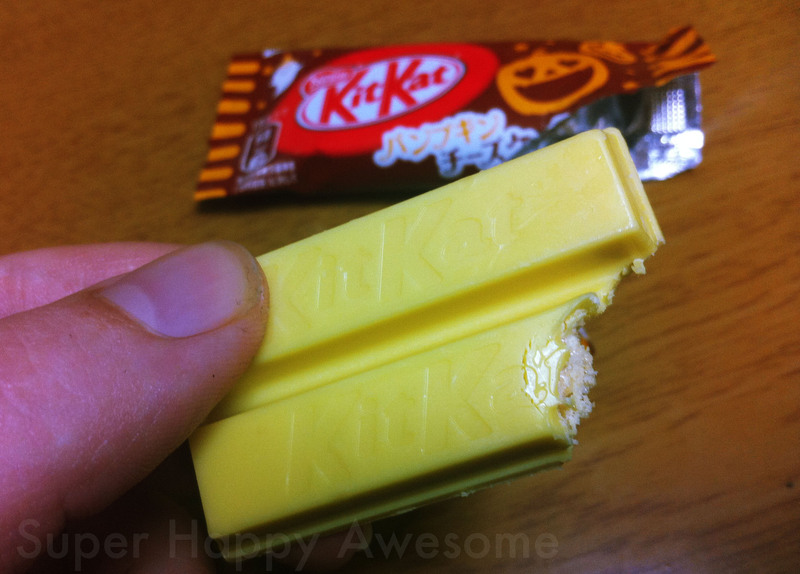 This entry was posted in Food!, Kit Kats! and tagged かぼちゃ, cheesecake, Halloween, jack o lantern, Kit kat, Pumpkin, sweet. Bookmark the permalink. 8 Responses to Pumpkin Cheesecake Kit Kats! I had to re-buy the ones I bought to send home about 3 times, I liked them so much! Have you tried the pumpkin flavour at Baskin Robbins? We went for Haunted Cola and Witch’s Trick in our Halloween Parfait at the weekend but I still want to try the other limited edition flavours! wish we had those here…they sound really good! Finally got my hands on these; thanks so much for posting. I tried one with some nutmeg, too–yum! Have you seen a “yaki imo” kit-kat yet? The kabocha sounds good to me!